Alexandr Bastrykin, head of Russia’s influential Investigative Committee, is one of the most powerful individuals in the Putinite power system, but his biography is relatively unknown. Richard Sakwa has, however, been tracking the rise of this shadowy figure. Alexandr Bastrykin is one of the more enigmatic figures in Russian politics today. In Marina Litvinovich’s study ‘The Power of the Families: 20 Clans that Control the Russian Economy’, Bastrykin gets only two marginal mentions. Yet, in fact, he played an important role in the prosecutions of Mikhail Khodorkovsky and other officials associated with the Yukos oil company, and he has acted as a loyal instrument of the administrative system as it has consolidated its power. Although formally appointed to uphold the rule of law and to defend the constitutional state, Bastrykin epitomises the failure of the spirit of constitutionalism to take root in Russia. Bastrykin is a former classmate of Putin’s, one of the ‘Pitertsy’ (after ‘Piter’, the affectionate name given by St Petersburgers to their city), the group who surged to occupy leading posts as Vladimir Putin consolidated his power in Moscow. Born in 1953 in Pskov, in 1975 he graduated, along with Putin, from Leningrad State University’s law faculty, and later undertook postgraduate studies there, becoming a Doctor of Law in 1980. After a chequered career, mostly in various law faculties where he produced over 120 academic publications, in October 2006 he became the deputy Prosecutor General. Like so many of Russia’s elite with academic ambitions, in 2007 Bastrykin was accused of plagiarism, when it turned out that parts of his book Fingerprinting (2004) were rewritten from a well-known German publication on the subject by Jürgen Thorwald. The Petersburg group is sharply divided between the security officials and the liberal economists and lawyers, and given his background one would expect Bastrykin to be associated with the latter. In fact his name is usually linked with Igor Sechin’s faction among the siloviki, the hardline ‘men of force’, most of whom have emerged from the ranks of the security services and the military. In the Minchenko report on the ‘Politburo 2.0’, Bastrykin is listed as part of the ‘power block’, and in that capacity he was heavily involved in driving forward the second Khodorkovsky/Lebedev trial. There had long been plans to separate the investigative functions of the Prosecutor General’s Office (PGO) from the Procuracy as such. This was part of the judicial reform advanced in November 2003 by the then head of the presidential administration Dmitry Medvedev and his deputy Dmitry Kozak. Their plan envisaged a drastic reduction in the PGO’s powers, above all by handing its investigative authority over to a specially created investigations committee. The initiative was blocked at the time by the combined efforts of Prosecutor General Vladimir Ustinov and Sechin, one of the most powerful figures in the Kremlin. Kozak’s reforms encountered resolute hostility from Ustinov, the person who had got the job that Kozak had wanted. However, when in spring 2006 the Procuracy under Ustinov sought to demonstrate its power and autonomy by launching criminal cases against customs officials, regional authorities and some members of the Federation Council, the administration was alarmed. With the PGO’s help, it would not have been difficult for Ustinov to seize power in the country, and so he was dismissed from this key post, although he remained in the administration. To maintain the factional balance, Ustinov was then appointed Minister of Justice, while Yury Chayka, the former Justice Minister, took over in turn at the PGO. This ministerial merry-go-round belied the seriousness of the affair. Given Putin’s reliance on security structures it was not surprising that they should become the focus of bureaucratic-factional power struggles, but the intensity of the conflicts within the law enforcement and secret services was extraordinary and ultimately posed a threat to the presidency itself. The result was a revisiting of the Medvdev-Kozak plan, with the creation In June 2007 of a new Investigative Committee (IC; in Russian Sledstvennyi komitet, SK), in the General Prosecutor’s Office (but note, not under), and with Bastrykin appointed as its head. Formally, the head of the IC was appointed not by the Prosecutor General but by the Federation Council, following nomination by the president. In practice, the appointment was sponsored by Sechin, who was hoping to make up lost ground after the dismissal of his close ally Ustinov the previous year. The IC took over many of the PGO’s powers and 18,000 of its investigators, as well as responsibility for some 60,000 criminal cases. The Prosecutor General lost the power to initiate investigations (including those into the affairs of MPs and top officials), seize property or open criminal cases. The head of the IC can launch an investigation into the affairs of the Prosecutor General, but the latter cannot return the compliment (this requires the approval of three Supreme Court judges at the president’s request). To demonstrate the IC’s autonomy, it was given a number of prestigious office buildings and its own teaching and research institutes. The IC also enjoys the right to initiate legislation, working through the president and government. The new body took over all politically sensitive investigations, including those into officials and politicians. 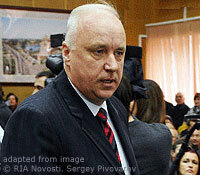 Factional conflict intensified with the arrest of the deputy Finance Minister, Sergei Storchak, charged in November 2007with embezzling $43.4 million from the state budget. His arrest signalled an attack on the reformist wing in the government, orchestrated, by all accounts, by Sechin. Storchak had been in charge of negotiations to pay off Soviet-era debts, and was one of the leading experts in the field. Alexei Kudrin, the Minister of Finance, who at the time of the arrest was about to leave with Storchak for an international meeting of Finance Ministers in South Africa, strongly backed his deputy, but many felt that the main object of the exercise was precisely to teach Kudrin just how low he was in the real hierarchy of power. Storchak’s arrest followed the detention a month earlier of General Alexander Bulbov, a close associate of Viktor Cherkesov, the then head of the Federal Drug Control Service and another one of the Pitertsy. Bulbov had been investigating the long-running ‘Three Whales’ corruption scandal, and the PGO attempted to stop the arrest, but it appears the case was driven by the IC and Bastrykin personally. The public nature of the battle over the Storchak and Bulbov arrests revealed the intensity of the conflict between the IC, attempting to carve out an independent sphere of action for itself, and the PGO, which was clearly dissatisfied with the loss of its investigative functions, and sought to do more than simply monitor the judicial process. The Storchak case saw Bastrykin run headlong into opposition from Chayka and the Prosecutor’s Office: Bastrykin was considered an ally of Sechin and the Kremlin silovik gang, while Chayka was affiliated to the rival Cherkesov faction. The Investigative Committee went public with its condemnation of the PGO, yet another sign of the fragmentation of Putinite elite structures in the dying days of his presidential term and the battle for the succession. In the end it was the IC that would triumph. A further consolidation in the IC’s powers took place in January 2011 when it became an independent agency, no longer even nominally subordinate to the PGO. As was typical of the Putinite system, balance was maintained by ensuring that the PGO’s powers in other matters were retained. Nevertheless, the IC is now a massive independent investigative agency, sometimes compared to the FBI, reporting directly to the president. It is at the head of this body that Bastrykin sits, and, like J. Edgar Hoover in an earlier era in American politics, is able to define who is a friend of the regime and who is an enemy. Bastrykin was not on the original Magnitsky list, but with the approach of the 13th April 2013 deadline set by Congress when it passed the Magnitsky Law in December 2012, the US State Department has come under considerable pressure to include names not only of those directly involved in Sergei Magnitsky’s death in November 2009, but also other leading Russian officials. Prominent among the names mentioned have been Ramzan Kadyrov, the authoritarian president of Chechnya, and Alexandr Bastrykin. Bastrykin was allegedly implicated in the Magnitsky cover-up, and certainly endorsed the IC’s decision in March 2013 to drop the criminal investigation into the circumstances of Magnitsky’s death. Bastrykin’s present notoriety, however, comes above all from his involvement in a number of prosecutions of opposition figures. As with the bitterly factionalised succession operation in 2007/08, the move of the presidency from Medvedev back to Putin in 2011/12 was accompanied by vicious intra-elite intrigues. The big difference in the later succession was the dramatic and unprecedented explosion of popular protest, not only against the deeply flawed parliamentary elections of 4 December 2011 but also against the cynical spirit with which the whole operation was conducted. In the early demonstrations, in Bolotnaya Square on 10th December and Sakharov Avenue on 24th December 2011, the authorities kept a relatively low profile. However, the protest rally on 6th May 2012, the eve of Putin’s inauguration for a third presidential term, was marked by violent clashes between demonstrators and the police, with many arrests made, even though the evidence in many cases was questionable. Putin was clearly shocked by this challenge to his authority, and sought revenge against some of the key opposition leaders. Alexei Navalny, one of the most prominent opposition leaders, faces multiple criminal charges. Others under investigation include Sergei Udaltsov, the Left Front leader, and various other oppositionists, including Ilya Yashin, co-head of the Solidarity movement. The attack was led by the IC, the loyal instrument of the Kremlin’s disciplinary strategy, and was followed by tough new legislation, signed into law by the president on 8th June, providing for heavy fines for people who take part in protests that violate public order rules. In response, in June 2012 Udaltsov called for ‘Occupy’-style protests outside the IC’s building. It was at this time that one of the more bizarre incidents in Bastrykin’s career caused a sensation. Bastrykin allegedly threatened to kill the Novaya Gazeta deputy editor, and head of its investigative reporting section, Sergei Sokolov, and then joked that he would investigate the murder himself. Bastrykin, clearly a man with a fine sense of humour, had been incensed by an article written by Sokolov that imputed that he had connections with organised crime. The accusation was made in a report on the trial of a gang charged with the massacre of 12 people (including four children) in Kushchevskaya, in the Krasnodar region, in November 2010. The gang had apparently been terrorising the district with impunity for years, thanks in large part to its close links with local officials. The article, which came out on 4th June, called Bastrykin and Putin ‘servants’ of criminal gangs. Bastrykin responded by inviting Sokolov to a press conference in Nalchik, Kabardino-Balkaria, where the chief investigator into the Kushchevskaya events spoke. At the press conference there was a confrontation between the two men, with Bastrykin exclaiming: ‘I consider myself insulted, and not just personally. In Tsarist times they would have called people out to a duel over this’. After returning to Moscow in Bastrykin’s jet, Sokolov was driven by the official’s bodyguards to a forest near Moscow. The bodyguards were then ordered to leave, and Bastrykin, who was in an ‘extremely emotional condition’, allegedly threatened to cut off the journalist’s head and legs. Soon after, the editor of the paper, Dmitry Muratov, published a scathing condemnation of Bastrykin. Fearing that the incident could escalate out of control, the Kremlin apparently convinced Bastrykin to back down and issue an apology to Sokolov, Muratov and other Novaya Gazeta journalists. The fact that the only penalty imposed on Bastrykin was an apology is vivid testimony to the impunity enjoyed by top officials in Putin’s Russia. In the light of the Bastrykin scandal, the campaign against oppositionists was seen as a way of diverting public attention away from his personal travails. More broadly, the fact that such behaviour could apparently be sanctioned and proceed without the go-ahead from above suggested that Putin’s so-called ‘power vertical’ was disintegrating. It was no longer clear whether repressive and other initiatives originated at the top or were set in train by increasingly uncontrollable agents. The uncoordinated and often dysfunctional initiatives of the regime and above all its various institutions suggested the unravelling of the system of ‘managed democracy’ so carefully constructed in Putin’s first two terms. The debate continues over the degree to which the high-profile raids against the opposition were inspired by the Kremlin, or whether Bastrykin interpreted the signal from above in the most radical manner, as a way of enhancing his own political status by putting himself at the forefront of the new repressive trend. In the end the Kremlin was forced to cover for Bastrykin’s actions, which placed it in a position of dependency to its own security apparatus. In June 2012 the IC even called for Communist MP Vladimir Bessonov to be stripped off his parliamentary immunity, since he allegedly broke the law on the holding of rallies and resisted the police in their attempt to end an unsanctioned demonstration in Rostov in December 2011 (the law does not allow the IC to address Parliament directly, although the Prosecutor General has the right to request parliament to allow a criminal investigation of one of its members). The politicisation of Bastrykin’s IC is obvious in its attempts to carve out a leading role for itself in the new Putin era of intensified repression. It is also in the vanguard of the renewed anti-corruption campaign. In 2012 the IC initiated criminal proceeding against more than 800 state and government officials, including some 600 lawmakers at various levels and elected heads of municipalities and local authorities, 19 members of regional legislatures, 29 electoral commission members, six judges and 100 investigators from various agencies, including fifteen from the IC itself. In 2005 Security Council head Nikolai Patrushev called the siloviki Putin’s ‘new nobility’, but it is hard to see Bastrykin as ‘noble’, despite his apparent enthusiasm for duelling as a means of settling disputes. And as early as 2007, in the wake of the Bulbov arrest, Viktor Cherkesov inveighed against ‘warriors’ degenerating into ‘traders’ and warned against ‘internecine feuds’ in the security services. He argued that ‘any corporation, including a Chekist one, should respect norms in order to be healthy … If these norms disappear and there is arbitrariness, then the corporation collapses’. Significantly, he singled out the then newly created Investigative Committee for attack. He also talked in terms of the elite being a ‘caste’, suggesting interlocked networks of family and other ties, and noted that ‘you cannot be a trader and a warrior at the same time’. The problem, if anything, worsened in the following years, with the merger of power and property relations within the regime. The evident wealth of so many of Putin’s acolytes suggested the degeneration of the ruling elite. It is for this reason that in 2013 the Kremlin launched an anti-corruption campaign in an attempt to discipline its own elites. Several prominent United Russia deputies with multi-million dollar properties abroad (notably the head of the parliamentary Ethics Committee, Vladimir Pekhtin) were forced to resign as MPs as Putin tried to ‘nationalise’ the elites. The scale of Bastrykin’s ‘trading’ activities is unclear. In 2012 Alexei Navalny used his popular blog to expose the IC head’s alleged undeclared assets in the Czech Republic, and the fact that he had a residence permit there. Given that the Czech Republic is a member of NATO, Navalny noted that this inevitably raised questions about Bastrykin’s security clearance for work at the top level of Russia’s law enforcement agencies, and dubbed him ‘foreign agent Bastrykin’. It is not surprising then that Bastrykin’s IC has been hounding Navalny, although its efforts have probably only increased his status as a popular hero. Despite his flaws, however, Bastrykin is unlikely to be fired any time soon. He is too useful to Putin at the head of this crucial agency. Above all, his personal loyalty is unquestioned, and today this, rather than demonstrable competence, is the main criterion for survival. This article is published under a Creative Commons licence. If you have any queries about republishing please contact us. Please check individual images for licensing details.